Do You think there is hope for a Mod kit, Or at least some free DLC? I think there'll be an update, but mostly for Updating translations and adding new languages. However, we are still trying to crack the game to allow modding. I really hope that they'll at least give us a hand at modding, if not a complete mod kit. Simply making the resources a bit more accessible would be great. I don't think an official DLC is likely. If we do manage to mod the game you'll probably have more than enough mods to play with though. and the compressed data would immediately follow. hope that's helpful to get started with! Well I have no idea how to work with binary data (yet), but it looks like enough for davidc or MyGod to start extracting resources with. I understand that you've still got a full plate with porting and whatnot of Little Inferno so no problem with slow replies, I'm glad you replied at all. Thanks a bunch! That's likely to be a big help. Thank you! Speaking of work, do you think there would ever be an Android port of the game? It sounds like it would just plain make sense to play this game via touch. I dont mod, I was just hoping for someone to mod. Mygod should be able to get started with that though, Thanks for the help! No comments or anything sane in the code; just threw it together for now. If you want to mess with the output files, use 7-zip to pull the resources out of the exe- I tried it on .rsrc\20480\1 and the stuff it spits out in out.txt looks right. Then run liDecompress.exe [file] and it'll spit out the individual resources into output\, with the filenames as the ID's of each resource. @Allan: It'd also help to know what file format the resources and such are in; are the filenames packed in anyplace, or are they all just .png files? What little zlib testing I've done spits out some pretty large files in comparison, so I'm led to believe you guys didn't use standard .png's in here; more like some uncompressed format, tho I'm not sure what image type to expect, since not a lot of uncompressed image types have an alpha channel. EDIT: Couldn't keep my mind off it; made a second attempt. EDIT: See comments below for link. Afaik, this one works... decompresses the output files, renames them .png for lack of anything better. Gonna try poking at the files a bit to see if I can figure out what they are and if I did everything correctly. File sizes and header data sizes agree, so that's looking promising. Oh wow, sounds good. I might check out that program later on. It's times like this I wish I knew a more advanced language like C++. WAIT! Some of the flags are zero! Allan what does that mean? By the way, davidc, I can't post this url correctly! Please fix. I wrote a program and got a lot of errors and warnings. Error details: (System.IO.InvalidDataException) Block length does not match with its complement. Ok... I think there's something wrong with that. Allan could you give us more information? if the compression flag isn't set in the table of contents then the resource data is already uncompressed and there is no compression header in front of the data. i think sounds are stored that way because they are vorbis data which wouldn't benefit from being zlib compressed. finally after the pointers comes a big blob of null terminated, utf8 encoded strings. I mean, you guys knew that there's a giant community surrounding World of Goo and making mods for it, even with the encrypted XML. And you knew we'd want to mod this game too, to add new features and other cool stuff. Right now we're having to extract the game's exe (an irreversible process, so we obviously can't do anything so simple as change a single image) and create custom tools to even do something so simple as extract a single sound effect from the game. Did you intentionally make this difficult to mod? Why don't you add a password lock on the resources, to keep everyone out? I mean, I don't see how this would be any easier for you guys to work with, unless this is some sort of archive system that you've been using for a while anyway, and you had tons of tools to work with it to begin with. Are you planning on refactoring it all later to make it more mod-friendly? If so, why all the trouble to make a custom archive format now? Ok, so it's all 180 MB, which is quite small for any game, but I know I personally wouldn't mind a few hundred extra megabytes if it were easier to get into. If I can plug all this in right, I may be able to get back the original filenames. It does seem to me that I'm still missing something crucial. If these are indeed the original filenames, and these files themselves are just compressed using zlib as-is and stuck into the resource blobs, there's something wrong; as PNG images shouldn't compress that much using zlib as they're lzma compressed already, and the headers for each resource item are spitting out a much higher uncompressed than compressed size which matches up with the file sizes I'm getting out. I think I'm doing this all correctly, but I'm not getting meaninful image data (or text data, or anything of that sort; the list above is the first meaningful thing I've seen so far) back out. Is this raw image data, that has a header of its own and raw pixel data following? because that's what it looks like to me. Enough repeating patterns in the data when I look at it with a hex editor to lead me to believe it's an image or such, but there's no standard image header for me to be able to open it with any image program I own. Any feedback on that? EDIT: Yah, you did say this. I didn't read closely enough. Nevermind. Anyways, thanks. This'll keep me busy for a while. basically implies that without said "tools" any modding would be a reverse-engineering nightmare. Unless we somehow managed to reverse engineer a similar set of tools, which would be both difficult and time-consuming. I like hacking stuff, but not quite that much. We could probably use Resource Hacker to patch changes back into the original exe, but getting the resources into packageable form would be difficult. Here's my latest version of my decompressor, which should work fine for extracting uncompressed files, as well. Until we get more info, though, I'm done. EDIT: See comments below for link. Anyway I'm going to post my working program! How to use: Install .NET Framework 4.5 before using this program. Drag these files onto the program at the same time to start unpacking: 1, 2, 3, debug.pak. P.S. I'm not sure if my program puts everything in the right place but I checked vdata/wordPackDict.dat and that file is correct. (Daxar you have seen it, I extracted this file from the memory and posted it onto the site) I wonder what format other files are using. Daxar this program doesn't seem to use standard png or flac format so it should be good to pack them. Excellent job, Mygod. I was wondering where you got those words from. Yeah, seems that they stripped or unpacked the PNG and FLAC's (And XML, and everything else...) somehow before packing them into the resource blobs, since I'm getting the same sort of thing back as well. I imagine they're using some custom format for each resource item. But it's cool to see everything extracted and in the right place with the right filenames, even if in the wrong format. EDIT: Oooh, I think I may have figured out the PNG's. On the right you see me hexediting data/_common/MsNancyBigEyeRightClosed.png. On the left, you see my calculations. First is the size of the image, in bytes, that I got from the editor. Second is the first value you see in the editor, 0xAE, in decimal. 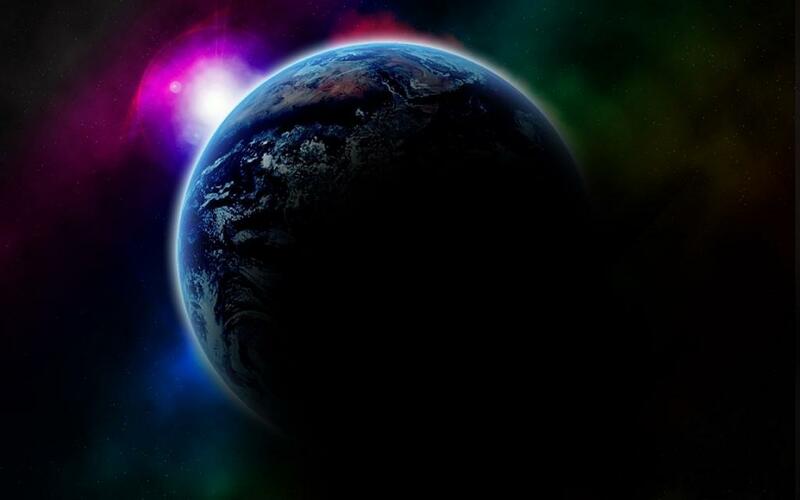 Looks about right to be the dimension of the image (dunno if it's width or height). Third is 0xA7 in decimal, again about the right size to be the other dimension. Multiplying them together, you get 116232, exactly the size of the file (minus some header size). I'm not sure what the 1 is in there; probably another version number. Should be enough to be able to reconstruct the image and use libpng or such to get it back into its original form. Ok, time for class now. Or similar. Assuming little endian, ofc. EDIT3: It's either bgra or rgba or such; alpha is the last value. It's FF in the middle of the image whenever the first three values are nonzero (Usually-- ofc there's antialiasing). For example, in this image, at 0xE4FC - 0xE4FF, the values are 95 95 95 FF, opaque grey. EDIT4: Yep, above data is correct. Image data is in BGRA format. Oh sweet. Yeah, just having the resource tree is already a good step forward. This is getting exciting! Thanks to MyGod and Allan for their work! Only the combo items, but hey. I'll call this my 0.1 version; it should be quite usable. See the readme for details on extracting. Currently, it only extracts PNG images correctly, and a few of those end up botched (I think it's different formats or something for the data, haven't looked into it yet), but hey, it's a small price to pay to be able to extract all the images from the game. Source code is provided, though it may be difficult to compile since I'm using three third-party libraries: zlib, libpng, and ttvfs (Tiny Tree Virtual File System- a friend made it). By the way, there's no UTF-8 support yet, so non-ASCII paths would fail horribly. I haven't seen any yet, so that may be a nonissue for now. Takes a while (~4 mins on my comp) to extract everything, but it should be fairly robust. Give it a shot if you want to look at all the pretty images. Oh, and the .png.normal images are standard PNG's as well. liDecompress extracts them correctly, as well. I'll have to add that as a test case. Later. For now, I'm calling it done until we get more info. EDIT5: Using the table and data format Allan gave us to extract itself, resource 4 of debug.pak is the aforementioned magic resource 0xB7E44207, which extracts to vdata/residmap.dat. Now ya know. 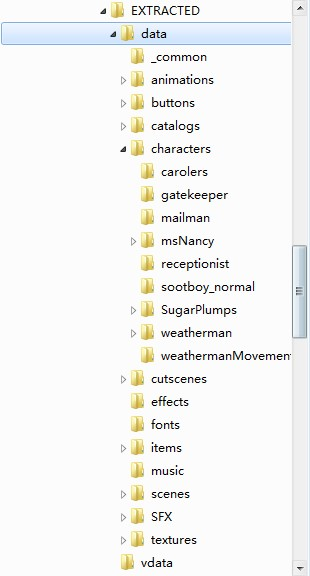 There are three other resources in there, too, files for some sort of debug font. ok, first to address the data format ranting. i completely understand that from the point of view of modding the game, the data formats that we used are inconvenient and create a high barrier to entry. believe me, i get that. it would be really nice if the data were stored in a format that you could work with natively without having to spend time applying pointless transformations. it would be really nice if you didn't need any external dependencies so that the code wouldn't be "difficult to compile since I'm using three third-party libraries." well good news! these things were major design goals! but they were goals from the point of view of the game's runtime code, not from the point of view of modding the game. this is pretty standard stuff for console game development, so if you decide to continue with these modding efforts for little inferno you're going to run into a LOT more of this binary data to sift through. if you decide not to then that's up to you of course but i'll tell you i was really looking forward to seeing what you guys could come up with because i know there was some pretty cool stuff made for world of goo! and to answer some questions. the third field in the header for textures is another 32 bits of flags. the first 2 are width and height as you already figured out. the reason that a few of your pngs might be coming out looking wrong is that there are a few textures in the game stored using a different pixel format (flag 0x08 should be set for these textures.) they are greyscale images that have a single 16bit color channel and a single 16bit alpha channel per pixel for a total of 32bits per pixel. the first byte of a pixel's data is the low 8 bits of alpha, the second byte is the high 8 bits of color, the third byte is the low 8 bits of color and the fourth byte is the high 8 bits of alpha. RAW2PNG converter injected. Thanks for your useful information. I will post a new one after I finish debugging. NOW I NEED TO KNOW HOW TO OPEN THE FLAC FILES! I CAN'T WAIT TO LISTEM TO THEM!!! Awesome Daxar! I'll be sure to check that out soon and fiddle around with all the "pure" images. It might let use make the site a bit better-looking too (instead of having to use screenshots). @Allan: About external .pak files, that's awesome. That means that we just need to be able to extract the images properly, and from there on we can just make a program like GooTool (InfernoTool?) that does the 0s in the .exe and the .pak organisation. Either way it seems better than having to stuff everything back in the .exe with every mod. How to use: Same as above. 1. I didn't find any greyscale images. Could you give me an example? 2. How to open those FLAC files? 3. What does those .png.normal files do? 4. How to open those .xml files? 5. And, why are there two channels for greyscale? EDIT: I'm attempting to patch the exe to use external .pak files. What's the behavior if these files are missing (i.e. how do I know if I'm patching it correctly, or do I have to modify the external .pak files in order to see any changes)? 3. The .png.normal files are standard PNG files used as normal maps for the rendering engine. See http://en.wikipedia.org/wiki/Normal_mapping for a description of what they're for. 2. the flac files aren't really flac data at all (similar to the pngs) although they originally started off that way. the actual data they contain is mostly a raw vorbis data stream (like the raw pixel data in the textures) but it's not in an ogg wrapper so it's not really a .ogg file either. i can probably provide a tool to convert between a real ogg file and the sound resources the game uses. 3. as Daxar mentioned they are normal maps that the renderer uses to light the items when there is fire nearby. 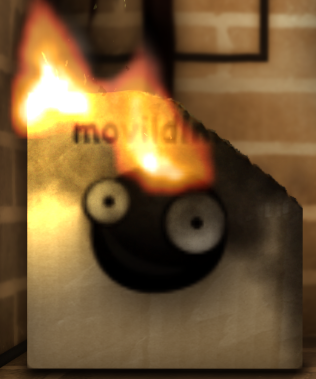 if you get a pirate doll in the fireplace and create a flame with your mouse right next to him, it's the data in the normal maps that allows the surfaces of the pirate to light up in the direction of the fire and give it a pseudo 3d look. 4. the various xml files represent a few different kinds of resources which all have their specific data formats. animations (.anim.xml) and particle effects (.effect.xml) are probably the main ones you might see in there. 5. there are 2 channels but only 1 is for color. these images are used sparingly in a few places where we needed a really dark gradient. if you imagine a full screen gradient that goes from RGB(5,5,5) on the left side of the screen to RGB(9,9,9) on the right, there are only 5 different intensity levels to play with in between and so depending on the brightness and contrast of the display you're using sometimes that can result in really visible bands across the screen. using this fake 16bit format gives us a larger dynamic range to use and much better results, especially on tvs for the wiiu version of the game. to know if you're patching the exe correctly to look for pak files externally, first patch out the 3 paks inside the exe by updating their resources to be just 4 bytes of 0s each. the game exe should be around 3.7 MB once that's done. now, try running the game without any of the external paks present in its directory. if it pops up a message that it could not open the resource pak file 'whatever.pak' then you know that it's trying to load the paks from the external source. after that, copy the paks with the proper names into the same directory as the exe and the game should run normally but now it's definitely using those external paks. Daxar can I just say that program is fantastically awesome. All the .pngs, as well as the .xmls and .flacs (even though they're currently unusable) makes me feel like I'm looking at WoG's resources again. I totally can't wait to look at what sort of stuff we can do with the .xmls! Talking about WoG, I've noticed that some of the gear images (e.g. data/_common/gear1.png) are practically exactly the same as those from WoG: loving it. Looking forward to progress! I really wish I could help! Hmm, ok. I figured I was probably patching it wrong. UpdateResource() wasn't behaving properly for me; time to fiddle around with it some more. 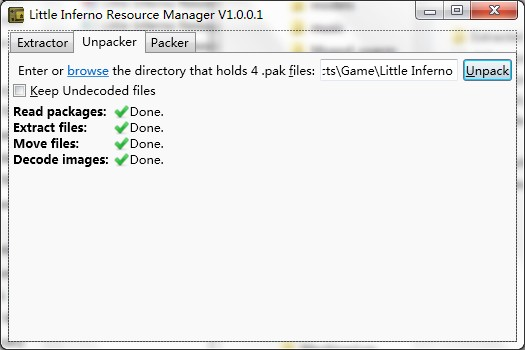 When run on the Little Inferno executable, it creates the proper resources, which EnumResourceTypes() and EnumResourceNames() show as correct and the right size, and my .pak extraction program pulls out as 4-byte, 0-filled files like it works, but the executable size remains the same and the executable still runs as normal. I feel like it should be an annoying, stupid error on my part but I just can't see it. Well, derp. Apparently that's what I was missing. I knew it would be something obvious. Thanks! Now the default resource-extraction program strips the game's executable so that it runs off the .pak files in the same directory (The old program is still there, as well). Just need to add a .pak compression program and the game will actually be moddable! Woot! Of course, this version in particular should be run off a copy of your game, so make a backup before stripping. 1. Okay thanks. I found them. I just realized I entered the incorrect value. Now my program works well for them too. 2. Instead of providing tools, could you tell us how to do it so we can convert them to ogg or something without running an outer program? 3 & 5. Get it. Thanks. 4. And fonts(.font.xml) too. How can we modify them? @Allan: I wonder how we can get the console mode? By the argument to run exe or add debug option in settings.txt or using the keyboard shortcuts? I think I can convert them to XML files so that we can modify the text in the game. My program only works for residmap.dat, so I guess other .dat files are using a bit different format. How to use: I believe this one is easy enough for you. Performance: 12s to extract pak files, 2 mins to unpack pak files. Packer module is under development. P.S. I think I'm going to research about the audio now. font data is yet another resource format that will need to be documented along with the ones i mentioned earlier. i think the most useful data to be able to edit first though might be the item data since it's pretty straight forward to change some simple values and get real changes in game. i figured we could dive into that once repaking is working. any files that end in .dat are just generic binary data files with a .dat extension because i needed to make up some extension to give them. they all share common building blocks (like the BinHdrPtr structure and the string table structure that i described before) but don't have a single unified format that could be used to automatically convert them to xml or something like that. their data is all formatted to be used directly by the code that works with it in the game with minimal processing once it has been copied into memory from the pak files. you can think of all of these resources as in-memory versions of the game's data which has been serialized out to disk for transport. and again I ask you to reply to the question - how i can get the console mode? please give an answer to this vital question... thanks! You made really nice job guys, especially Daxar! Speaking about fonts, I'll help adding Cyrillic letters. I've already emailed Kyle about them. Allan, could you tell me names of fonts you used in the game. I'll make Russian fonts. The point is that Cyrillic letters don't exist in Tw Century whatever font, so I have to draw them by hand. This is not that difficult, if someone could then pack them, that would be great. Here's a link to some fonts that I (and Vladislav) created with respective mappings. @Vials What is Zog forums? @Vials: Just for future reference, please edit your previous posts instead of double-posting. Thanks! @Allan: Please don't wait for me before explaining stuff. x_x I'll be working on a school project the next few days. @Mygod: Hmm, strange that it didn't work for you. In any case, kudos on the cool GUI! Another question: how do I know where I should put a new file, resource.pak, embed.pak or frontend.pak? Modded the game to make it crash successfully. as for adding new files to the paks, it doesn't really matter where they go. the wiiu version of the game loads the different paks at different times and so it matters what goes where for that, but the pc version of the game is able to load any resource from any pak at any time. where wordStrId is the key for looking up the text in the string table and probability is a float in the range 0.0 to 1.0 that gives the probability that the word will be selected when you buy the word pack item. the total probabilities for all words should add up to 1.0. after that list of words there is a string table with the text for all the words in the same string table format that i described before. any specific requests for resource types to document next? or specific things about the game that you want to change as the first steps toward modding and i could tell you which resources would be involved? i'm going to work on the sounds but they might take a little longer since the process for those is much less straight forward. Well, anyway I think we'd better make everything in the right pak files since Wii U version matters. So I want to know that anyway. I think we can generate an index.xml that contains everything that is needed to make pak files and add .png extension for all recognizable pictures whatever it has the extension or not. What do you think, @Daxar? >any specific requests for resource types to document next? I think simply the decryption of XML files in general would be a huge help, we can probably figure out what most of them do and how they work by looking at the XML itself (as we did with WoG). I'm curious though, where is the data for the letters and combos held? Also in XML files or elsewhere? Wait... I find some of the pictures' flags are set to 2!!! EDIT: Now working on the packer module. Can't get it work. I didn't know that you know Russian Allan! Ok, I'll use the contact@tomorrow to comunicate about this. Vials is working on it too. I've seen him on ZoG forums talking about them. @Mygod: I don't think that's the error you're supposed to get when running the game. That's what I got when I stripped ALL of the resources from the game, rather than just the .pak files. 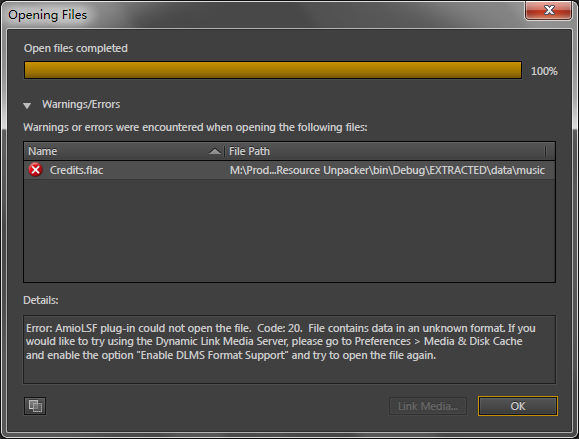 It should say something about being unable to open a .pak file rather than saying that an unhandled exception occurred. @Allan: Knowing the XML file format next would be pretty tops. What's New: Fixed a lot of bugs! And add the exciting packer & injector module! Improved the performance of extractor. P.S. It doesn't support compressing currently and I will be working on this as soon as the uncompressed version works. Introducing the very first Little Inferno mod! - first, back everything up. I haven't extensively tested everything, and something might break. You should be good to go. Let me know if you have any trouble. 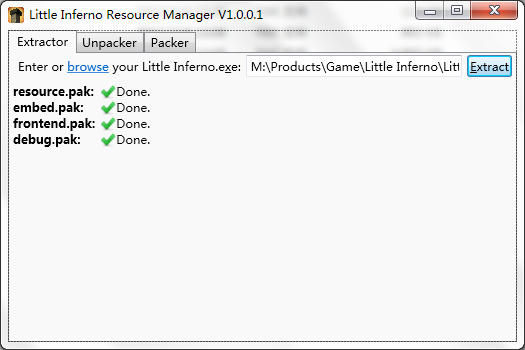 Finally, you've got first mod evah for Little Inferno! I've tested the mod, it's working and I'm so excited! There's a lot of work ahead: writing documentation on how it works, adding mod pages on the site, DIscover everything! The gameplay possibilities will be endless! Call davidc here, quick! Oh you are a bit faster than mine. Good job anyway! Didn't work for me (just got the normal chimneys), but it's quite possible that it's because I'm running a version I copied from Steam, so it might be running the Steam version (since the overlay comes up). I'll download the non-Steam version and try it again. I'm getting lots of ideas for a GUI for all of this though, to make it all a bit cleaner and user-friendly. I'd volunteer to make one if I wasn't already so busy. Daxar, a question. 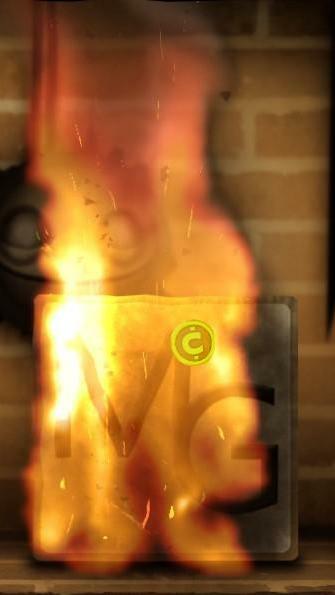 How did you made that ChimneyChanger.pak file? EDIT: Forgot to read Readme. Got it now.